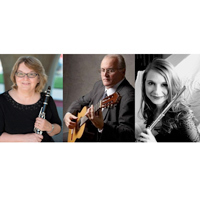 The Community Music School (CMS) at Webster University will host a recital featuring some of St. Louis's premiere musicians on Friday, Dec. 4, at 7 p.m. at the Community Music School Concert Hall. This recital, "Yesterday's Students, Today's Artists," celebrates the legacy of the CMS and Webster's alumni who are now professional teaching artists at the CMS. This event is free and will be open to the public. Performing classical to jazz to contemporary music, the recital will include CMS faculty members: Tom Byrne, guitar; Sandra Geary, piano; Julia Hornberger, cello; Chris Hubbard, saxophone; Karl Koesterer, piano; Jennifer Toro Mazzoni, flute; John McClellan, guitar; Katie Myler, clarinet; Sue Pankratz, piano; Elizabeth Ramos, violin; and Jeanine York-Garesche, clarinet. This recital is presented as part of a yearlong celebration for both the CMS and Webster University. The CMS celebrates its 90th anniversary and Webster University celebrates its centennial. For more information about the CMS visit their website.